Welcome to Browns, we are a family run business based in Leominster, Herefordshire with a wealth of experience in the supply and manufacture of oak timber and joinery products. With a combination of our highly trained bench joiners and the latest woodworking machinery Browns can produce anything upon request. Our range of joinery products include solid external oak doors, internal oak plank doors, cottage style softwood doors, traditional and bespoke oak windows and oak staircases. 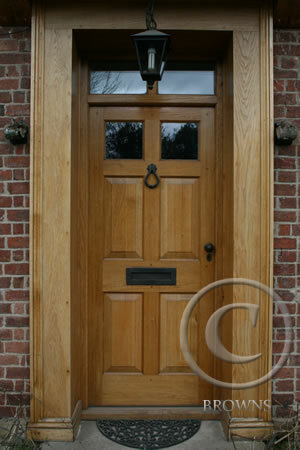 As well as oak joinery we also supply hardwood windows and doors, softwood windows and doors to be stained or painted. We are also able to manufacture Garden Rooms and Conservatories. Browns are specialists in the supply of quality kiln dried european oak and fresh sawn green oak beams. All of our Oak is imported from France and Germany and is PEFC Certified, giving you the guarantee that it is sourced from sustainable resources. We offer a full machining service for our oak planking including cutting timber to size and planing. At our premises in Leominster we carry large stocks of oak beams and dry oak timber. This enables us to supply builders and customers with a speedy and efficient service. We also have solid oak flooring boards in stock and all of the finishing products required. Many of our oak skirting’s and architrave are pre machined to be taken off the shelf, along with ironmongery and Osmo wood finishes. We can supply joinery nationwide so please call us and discuss your requirements with us and be confident that you are dealing with a company that will provide you with the highest standard of joinery for your home. We are members of the Guild of Master Craftsmen and the British Wood Working Federation and will always endeavour to provide a service that is second to none. Please visit our beautiful showroom showing examples of our joinery and timber products, alternatively we are only too happy to bring our knowledge and portfolio to you at your home. We hope you enjoy browsing our website and are always available for further advice and information. Please call our sales team and let us help you with your needs 01568 614053.